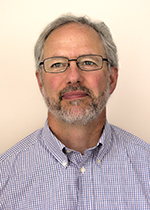 Michael Baechler has been with PNNL's Portland office since 1984. He manages the National Accounts Partnership (NAP), a part of DOE’s Commercial Buildings Initiative, and PNNL’s support to DOE's Building America Documentation and Resource Development Program. Building America activities include drafting best practices and case studies for residential energy-efficient construction and technologies in each of five climate zones. The NAP program provides technical design assistance to companies holding substantial building portfolios in the U.S. with the goal of achieving aggressive energy efficiency goals. In the past he has undertaken environmental and economic studies and assessments of power generation, marketing, transmission, and conservation. He managed the development of a dynamic modeling tool simulating power production and marketing across the western United States. He managed assessments of hydroelectric dispatch and power marketing for power generated in California's Central Valley Project. Analyses included both traditional and restructured utility environments. He managed an assessment of renewable energy for the U.S. Department of Defense. Mr. Baechler is the author of several environmental documents and over 70 books, articles, and reports. He Co-Chaired the 2008 American Council for an Energy Efficient Economy, Summer Study on Energy Efficiency in Buildings.